Description: CP 166 enters Conklin Yard as NS train 41T behind CN power waits to head west. Fellow rrpicturearchives contributor Sam Botts is seen at left. Description: 41T rolls past the signals at Tioga Center. There were once semaphores on both tracks here. Description: Sometimes the CN trains would get "family" power. Heres on with a WC unit between a pair of the common CN units this train typically got. Description: 41T rolls west at Miller Beach Rd with 64 cars, where the corn is high as an elephants eye on this August day. Description: After getting their paper work, the WC moved up to the switch so they could start to make their pick ups. Description: Waiting for another train. Description: The WC Transfer coming up to Central after dropping its CP cars on the highline. Description: fourth unit on 348 finally getting underway after waiting for Amtrak. Description: CN 494 shoves into the yard. 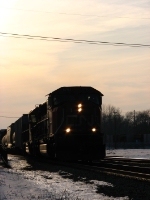 Description: CN 494 heads off out of the sunset. Description: Roster shot of CN 5763.